DNA Repair pathways in animal cells can be divided into two main categories: HR and NHEJ. HR or homologous recombination is a minor pathway but very important in protecting cells from genotoxicity. NHEJ is the major repair pathway in all animal cells and operates continuously during the entire cell cycle. NHEJ is both error prone and important for survival, by re-ligating DS DNA breaks to maintain genome integrity. Studies on NHEJ can be very beneficial for anti-cancer drug discovery projects, learning more about the process of NHEJ repair and establishing intersecting pathways and druggable pathway targets. A role of NHEJ proficiency in aging has also been reported. This is a cell-based reporter kit that is hosted by a human neuroblastoma cell line (SH-SY5Y) that can grow continuously in vitro and will terminally differentiate. This provides the opportunity of analyzing NHEJ in growing or terminally differentiated cells in a neuronal lineage. DNA is continually being exposed to genotoxic agents leading to cell death and/or changes in gene expression. Of the various forms of DNA damage, the most dangerous are DNA double-strand breaks (DSBs), which may create serious problems arising from inappropriate recombination such as chromosomal translocations. To deal with the threats posed by DSBs, cells have developed multiple mechanisms to detect, signal, and repair the regions in chromatin. Two main pathways,HR and NHEJ, are involved in the repair of DSB. These pathways are further subdivided into more specific sub-pathway processes. In prokaryotes, HR has been known to be a major pathway for the repair of DSBs, while in eukaryotes, NHEJ was thought to predominate. These pathways are largely distinct from one another, yet function in complementary ways. For example, NHEJ is not cell cycle dependent, while HR is strongly S-phase dependent. NHEJ involves the ligation of two DNA ends without homology and tends to be error prone while HR is high fidelity and essentially error free. In NHEJ, the broken DNA ends are modified for compatibility and then simply rejoined to restore DNA integrity. The resealing step is aided when there is some degree of micro-homology, even if only a few base pairs. The NHEJ process often results in mutation, however in some cases wild type sequence is restored. TopoGEN scientists have created a novel, cell based kit to follow NHEJ by simply assaying for the presence of GFP positive cells (Fig 1). This cell based/cell context system has been designed to allow researchers to examine and interrogate the NHEJ process in living HeLa cells. The Kit uses a mutated GFP reporter that has two I-Sce1 sites disrupting the gene. 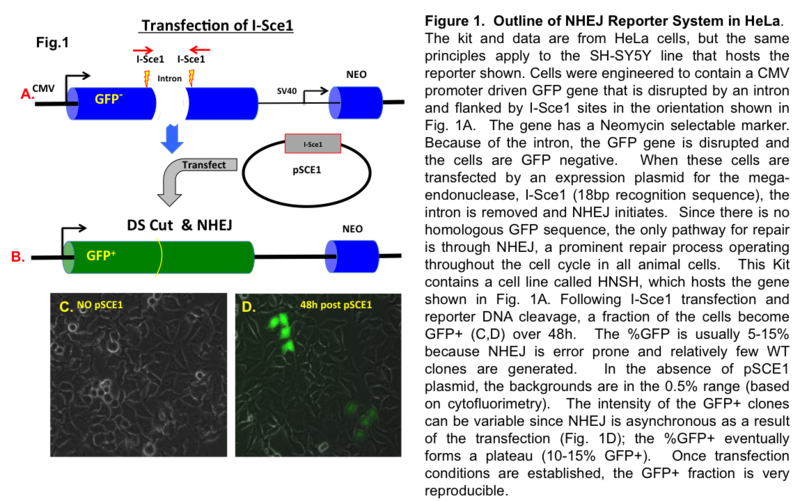 When I-Sce1 is transfected into the HN-HeLa line, the incompatible I-Sce1 breaks are repaired by NHEJ and the cells become GFP positive (over a 2-4d window). These cells can be tracked by live imaging or assayed using Cytometry, Cytometry imaging tools or simply counting %GFP+ cells by fluorescence (see Fig. 1D). HNSH Cells (SH-SY5Y) neuroblastoma cells acting as NHEJ host, ready for culture in T-25 flask. Neo (G418) stock for maintaining cell stocks. A detailed protocol describing how to set and use this kit for assaying NHEJ mechanisms in the cell host provided.